On the 15th of June, 1215, King John met his Barons on the field of Runnemede, the ancient meadow of council. His followers were few as he met more than two thousand Knights and Barons in arms encamped on the field. The Barons had sworn an oath that they would compel the King to confirm their liberties or they would wage war against him to the death. Theirs was a holy crusade against John to recover the liberties their forefathers had enjoyed and to restore the good old customs violated by an oppressive and mercenary ruler. Their demands had been presented to the King months before for his consideration, and before the day passed he affixed his seal to the original but preliminary draft known as the "Articles of the Barons." The exact terms of the Great Charter itself were decided and engrossed during four subsequent days of negotiation, and it was on the 19th that the great seal was affixed to all copies. These were all dated back to the 15th of June, and duly sealed by the King. The Great Charter of Liberties has become The Mother of Constitutions. The liberties of half the civilized world are derived from the English Magna Carta. It is recognized as the basis of our laws, and of national liberty in general. Long standing customs, called Common Law, had now become written law, among them, no taxation without representation, judgment by peers, and due process of law. Liberty is the keynote of the Charter, to have and to hold, to them and their heirs, for ever. The King is not above the law; the law reigns supreme. The eight Surety Barons profiled in this report along with King John of England are all ancestors. The lineage from each is shown to the side to make it easier for the reader to comprehend. (Latin for "Great Charter", literally "Great Paper"), also called Magna Carta Libertatum ("Great Charter of Freedoms"), is an English charter originally issued in 1215. Magna Carta was the most significant early influence on the long historical process that led to the rule of constitutional law today. Magna Carta was originally created because of disagreements between Pope Innocent III, King John and his English barons about the rights of the King. Magna Carta required the king to renounce certain rights, respect certain legal procedures and accept that the will of the king could be bound by law. Magna Carta was renewed throughout the Middle Ages, and further during the Tudor and Stuart periods, and the 17th and 18th centuries. By the early 19th century most clauses had been repealed from English law. The influence of Magna Carta outside England can be seen in the United States Constitution and Bill of Rights. Indeed just about every common law state has been influenced by Magna Carta, making it one of the most important legal documents in the history of democracy. After the Norman Conquest of England in 1066 and advances in the 12th century, the English king had by 1199 become the most powerful monarch in Europe. This was due to a number of factors including the sophisticated centralized government created by the procedures of the new Anglo-Saxon systems of governance, and extensive Anglo-Norman land holdings in Normandy. But after King John was crowned in the early 13th century, a series of stunning failures on his part led the barons of England to revolt and place checks on the king's power. One major cause of discontent in the realm were John's actions in France. At the time of John's accession to the throne after Richard's death, there were no set rules to define the line of succession. John, as Richard's younger brother, was crowned over Richard's nephew, Arthur of Brittany. As Arthur still had a claim over the Anjou empire, however, John needed the approval of the French King, Philip Augustus. To get it, John gave to Philip vast tracts of the French-speaking Anjou territories. When John later married Isabella of Angoulême, her previous fiancé (Hugh IX of Lusignan, one of John's vassals) appealed to Philip, who then declared forfeit all of John's French lands, including the rich Normandy. Philip declared Arthur as the true ruler of the Anjou throne and invaded John's French holdings in mid-1202 to give it to him. John had to act to save face, but his eventual actions did not achieve this—he ended up killing Arthur in suspicious circumstances, thus losing the little support he had from his French barons. After the defeat of John's allies at the Battle of Bouvines, Philip retained all of John's northern French territories, including Normandy (although the Aquitaine remained in English hands for a time). As a result, John was revealed as a weak military leader, and one who lost to the French a major source of income, neither of which made him popular at home. Worse, to recoup his expenses, John would have to further tax the already unhappy barons. Note: John's nickname of "Lackland" does not refer to these losses to France, but to the fact that, unlike his elder brothers, he had received no land rights on the continent at birth. At the time of John’s reign there was still a great deal of controversy as to how the Archbishop of Canterbury was to be elected, although it had become traditional that the monarch would appoint a candidate with the approval of the monks of Canterbury. But in the early 13th century, the bishops began to want a say. To retain control, the monks elected one of their numbers to the role. But John, incensed at his lack of involvement in the proceedings, sent the Bishop of Norwich to Rome as his choice. Pope Innocent III declared both choices as invalid and persuaded the monks to elect Stephen Langton, who in fact was probably the best choice. But John refused to accept this choice and exiled the monks from the realm. Infuriated, Innocent ordered an interdict (prevention of public worship) in England in 1208, excommunicated John in 1209, and backed Philip to invade England in 1212. John finally backed down and agreed to endorse Langton and allow the exiles to return, and to completely placate the pope he gave England and Ireland as papal territories and rented them back as a fiefdom for 1,000 marks per annum. This further enraged the barons as it meant that they had even less autonomy in their own lands. Despite all of this, England's government could function without a strong king. The efficient civil service, established by the powerful King Henry II had run England throughout the reign of Richard I. But the government needed money, for during this period of prosperity mercenary soldiers cost nearly twice as much as before. The loss of the French territories, especially Normandy, greatly reduced the state income and a huge tax would have to be raised in order to attempt to reclaim these territories. Yet it was difficult to raise taxes due to the tradition of keeping them at the same level. Novel forms of income included a Forest law, a set of regulations about the king’s forest which were easily broken and severely punished. John also increased the pre-existing scutage (feudal payment to an overlord replacing direct military service) eleven times in his seventeen years as king, as compared to eleven times in twice that period covering three monarchs before him. The last two of these increases were double the increase of their predecessors. He also imposed the first income tax which rose, what was at the time, the extortionate sum of £60,000. By 1215, some of the barons of England banded together and took London by force on June 10, 1215. They and many of the fence-sitting moderates not in overt rebellion forced King John to agree to a document called the "Articles of the Barons", to which his Great Seal was attached in the meadow at Runnymede on June 15, 1215. In return, the barons renewed their oaths of fealty to King John on June 19, 1215. A formal document to record the agreement was created by the royal chancery on July 15: this was the original Magna Carta. An unknown number of copies of it were sent out to officials, such as royal sheriffs and bishops. The most significant clause for King John at the time was clause 61, known as the "security clause", the longest portion of the document. This established a committee of 25 barons who could at any time meet and over-rule the will of the King, through force by seizing his castles and possessions if needed. This was based on a medieval legal practice known as distraint, which was commonly done, but it was the first time it had been applied to a monarch. In addition, the King was to take an oath of loyalty to the committee. King John had no intention to honor Magna Carta, as it was sealed under extortion by force, and clause 61 essentially neutered his power as a monarch, making him King in name only. He renounced it as soon as the barons left London, plunging England into a civil war, called the First Barons' War. Pope Innocent III also immediately annulled the "shameful and demeaning agreement, forced upon the king by violence and fear." He rejected any call for rights, saying it impaired King John's dignity. He saw it as an affront to the Church's authority over the king and released John from his oath to obey it. John died in the middle of the war, from dysentery, on October 18, 1216, and this quickly changed the nature of the war. His nine-year-old son, Henry III, was next in line for the throne. The royalists believed the rebel barons would find the idea of loyalty to the child Henry more palatable, and so the child was swiftly crowned in late October 1216 and the war ended. Henry's regents reissued Magna Carta in his name on November 12, 1216, omitting some clauses, such as clause 61, and again in 1217. When he turned 18 in 1225, Henry III himself reissued Magna Carta again, this time in a shorter version with only 37 articles. Henry III ruled for 56 years (the longest reign of an English Monarch in the Medieval period) so that by the time of his death in 1272, Magna Carta had become a settled part of English legal precedent, and more difficult for a future monarch to annul as King John had attempted nearly three generations earlier. 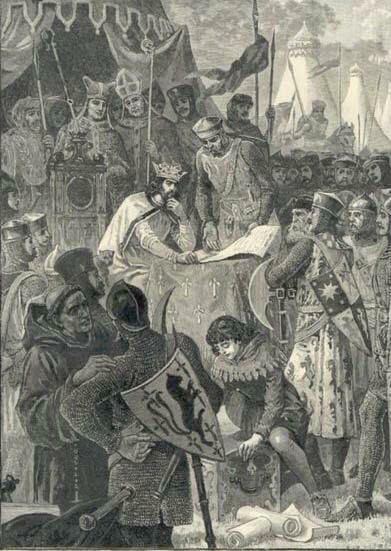 Henry III's son and heir Edward I's Parliament reissued Magna Carta for the final time on 12 October 1297 as part of a statute called Confirmatio cartarum (25 Edw. I), reconfirming Henry III's shorter version of Magna Carta from 1225. The Magna Carta was originally written in Latin. A large part of Magna Carta was copied, nearly word for word, from the Charter of Liberties of Henry I, issued when Henry I ascended to the throne in 1100, which bound the king to certain laws regarding the treatment of church officials and nobles, effectively granting certain civil liberties to the church and the English nobility. Clause 1 of Magna Carta (the original 1215 edition) guarantees the freedom of the English Church. Although this originally meant freedom from the King, later in history it was used for different purposes. Clause 13 guarantees the “ancient liberties” of the city of London. Clause 39 gives a right to due process. The 1215 edition was annulled in 1216 but some of the 1297 version is still in force today and preserves the rights listed above. In 1828 the passing of the first Offences Against the Person Act, was the first time a clause of Magna Carta was repealed, namely Clause 36. With the document's perceived protected status broken, in one hundred and fifty years nearly the whole charter was repealed, leaving just Clauses 1, 13, 39, and 40 still in force after the Statute Law (Repeals) Act was passed in 1969. 61. Since, moreover, for God and the amendment of our kingdom and for the better allaying of the quarrel that has arisen between us and our barons, we have granted all these concessions, desirous that they should enjoy them in complete and firm endurance forever, we give and grant to them the underwritten security, namely, that the barons choose five and twenty barons of the kingdom, whomsoever they will, who shall be bound with all their might, to observe and hold, and cause to be observed, the peace and liberties we have granted and confirmed to them by this our present Charter, so that if we, or our justiciar, or our bailiffs or any one of our officers, shall in anything be at fault towards anyone, or shall have broken any one of the articles of this peace or of this security, and the offense be notified to four barons of the foresaid five and twenty, the said four barons shall repair to us (or our justiciar, if we are out of the realm) and, laying the transgression before us, petition to have that transgression redressed without delay. And if we shall not have corrected the transgression (or, in the event of our being out of the realm, if our justiciar shall not have corrected it) within forty days, reckoning from the time it has been intimated to us (or to our justiciar, if we should be out of the realm), the four barons aforesaid shall refer that matter to the rest of the five and twenty barons, and those five and twenty barons shall, together with the community of the whole realm, distrain and distress us in all possible ways, namely, by seizing our castles, lands, possessions, and in any other way they can, until redress has been obtained as they deem fit, saving harmless our own person, and the persons of our queen and children; and when redress has been obtained, they shall resume their old relations towards us. And let whoever in the country desires it, swear to obey the orders of the said five and twenty barons for the execution of all the aforesaid matters, and along with them, to molest us to the utmost of his power; and we publicly and freely grant leave to everyone who wishes to swear, and we shall never forbid anyone to swear. All those, moreover, in the land who of themselves and of their own accord are unwilling to swear to the twenty five to help them in constraining and molesting us, we shall by our command compel the same to swear to the effect foresaid. And if any one of the five and twenty barons shall have died or departed from the land, or be incapacitated in any other manner which would prevent the foresaid provisions being carried out, those of the said twenty five barons who are left shall choose another in his place according to their own judgment, and he shall be sworn in the same way as the others. Further, in all matters, the execution of which is entrusted, to these twenty five barons, if perchance these twenty five are present and disagree about anything, or if some of them, after being summoned, are unwilling or unable to be present, that which the majority of those present ordain or command shall be held as fixed and established, exactly as if the whole twenty five had concurred in this; and the said twenty five shall swear that they will faithfully observe all that is aforesaid, and cause it to be observed with all their might. And we shall procure nothing from anyone, directly or indirectly, whereby any part of these concessions and liberties might be revoked or diminished; and if any such things has been procured, let it be void and null, and we shall never use it personally or by another. Barons, Bishops and Abbots who were party to Magna Carta. Surety Barons for the enforcement of Magna Carta (ancestors shown in Green). A surety is a person who agrees to be responsible for the debt or obligation of another. William d'Albini, Lord of Belvoir Castle. Roger Bigod, Earl of Norfolk and Suffolk. Hugh Bigod, Heir to the Earldoms of Norfolk and Suffolk. Henry de Bohun, Earl of Hereford. Richard de Clare, Earl of Hertford. Gilbert de Clare, heir to the earldom of Hertford. John FitzRobert, Lord of Warkworth Castle. Robert Fitzwalter, Lord of Dunmow Castle. William de Fortibus, Earl of Albemarle. William Hardell, Mayor of the City of London. John de Lacie, Lord of Pontefract Castle. William de Lanvallei, Lord of Standway Castle. William Malet, Sheriff of Somerset and Dorset. Geoffrey de Mandeville, Earl of Essex and Gloucester. William Marshall jr, heir to the earldom of Pembroke. Roger de Montbegon, Lord of Hornby Castle. William de Mowbray, Lord of Axholme Castle. Saire/Saher de Quincey, Earl of Winchester. Robert de Roos, Lord of Hamlake Castle. Robert de Vere, heir to the earldom of Oxford. Roger Bigod (c. 1150 – 1221), was the son of Hugh Bigod, 1st Earl of Norfolk and succeeded to the earldom of Norfolk in 1189, was confirmed in his earldom and other honors by Richard I, for his claim had been disputed by his step-mother in the reign of Henry II. King Richard also sent him to France as an ambassador in 1189. Bigod is the name associated with Framlingham Castle in Suffolk. It is an imposing structure. The outer walls are forty-four feet high and eight feet thick. Thirteen towers fifty-eight feet in height remain, along with a gateway and some outworks. In early Roman times it was probably the site of the fortified earthwork that sheltered Saint Edmund when he fled from the Danes in 870, but we cannot be sure of the authenticity of this tradition. The Danes seized the fort, but they lost it in 921; it then remained a Crown possession, which passed into the hands of William the Conqueror when he became King. In 1100 Henry I granted the Castle to Roger Bigod, and possibly Roger was the one to erect the first masonry building. The ruins indicate a 12th Century dating, though material from an older building may very well have been used in the walls. Evidently the Castle was completely rebuilt in 1170. It remained in the Bigod family for some generations then passed into the hands of the Mowbrays. Earl of Norfolk is a title which has been created several times in the Peerage of England. Created in 1070, the first major dynasty to hold the title was the 12th and 13th century Bigod family, and it then was later held by the Mowbrays, who were also made Dukes of Norfolk. Due to the Bigod's descent in the female line from William Marshal, they inherited the hereditary office of Earl Marshal, still held by the Dukes of Norfolk today. The present title was created in 1644 for Thomas Howard, 18th Earl of Arundel, the heir of the Howard Dukedom of Norfolk which had been forfeit in 1572. Arundel's grandson, the 20th Earl of Arundel and 3rd Earl of Norfolk, was restored to the Dukedom as 5th Duke upon the Restoration in 1660, and the title continues to be borne by the Dukes of Norfolk. He took part in the negotiations for the release of Richard from prison, and after the king's return to England became justiciar. Roger Bigod was chosen to be one of the four Earls who carried the silken canopy for the King, as Hugh Bigod had borne the Royal scepter in the Royal procession. return he was won over to the opposition by the rebel Barons and became one of the strongest advocates of the Charter of Liberty, for which he was excommunicated by Pope Innocent III. He died before August 1221, having married as his first wife, Isabella daughter of Hameline Plantagenet, who was descended from the Earls of Warren. Hugh Bigod (c. 1182-1225) was the eldest son of Roger Bigod, 2nd Earl of Norfolk, and for a short time the 3rd earl of Norfolk. In 1215 he was one of the 25 sureties of Magna Carta of King John. He succeeded to his father’s estates (including Framlingham Castle) in 1221 but died in his early forties in 1225. Roger Bigod, 4th Earl of Norfolk, born c.1209. Hugh Bigod, justiciar of England. Very soon after Hugh's death, Maud married William de Warenne, 6th Earl of Surrey. Richard de Clare, 4th Earl of Hertford (1162 – December 30, 1218) was the son of Roger de Clare, 3rd Earl of Hertford and Maud de St. Hilary. More commonly known as the Earl of Clare, he had the moiety of the Giffard estates from his ancestor Rohese. He was present at the coronation of King Richard I at Westminster, 3 Sep 1189, and King John on 27 May 1199. He was also present at the homage of King William of Scotland at Lincoln. Hertford Castle of the de Clares is one of two Castles: A 10th Century ruin or a 17th Century structure. The older Castle retains a wall and part of a Norman tower. The remainder of the building is a Jacobean accretion made of brick and completely modernized. He married (ca. 1172) Amice Fitz William, Countess of Gloucester (ca. 1160-1220), second daughter of William Fitz Robert, 2nd Earl of Gloucester, and Hawise de Beaumont. He sided with the Barons against King John, even though he had previously sworn peace with the King at Northampton, and his castle of Tonbridge was taken. He played a leading part in the negotiations for Magna Carta, being one of the twenty five Barons appointed as guardians. On 9 Nov 1215, he was one of the commissioners on the part of the Barons to negotiate the peace with the King. In 1215, his lands in counties Cambridge, Norfolk, Suffolk and Essex were granted to Robert de Betun. He and his son were among the Barons excommunicated by the Pope in 1215. 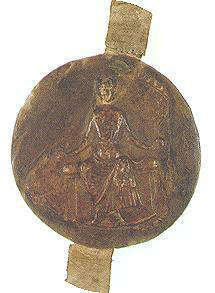 Sometime before 1198 Earl Richard and his wife Amice were ordered to separate by the Pope on grounds of consanguinity. They separated for a time because of this order but apparently they reconciled their marriage with the Pope later on. Gilbert de Clare, 5th Earl of Hertford (1180 – October 25, 1230) was the son of Richard de Clare, 4th Earl of Hertford, from whom he inherited the Clare estates, from his mother, Amice Fitz Robert, the estates of Gloucester and the honor of St. Hilary, and from Rohese, an ancestor, the moiety of the Giffard estates. In June 1202, he was entrusted with the lands of Harfleur and Montrevillers. Gilbert de Clare built a Castle at Caerdigan, Pembrokeshire, Wales. A marriage brought it into the hands of William Marshall, who soon controlled the strongest castles on the peninsula. The keep has been transformed into a modern house. Of all the castles that finally came into William Marshall's possession, this was the most important to the area. Scholars believe there is evidence that it was originally built of wood. In 1215 Gilbert and his father were two of the barons made Magna Carta sureties and championed Louis "le Dauphin" of France in the First Barons' War, fighting at Lincoln under the baronial banner. He was taken prisoner in 1217 by William Marshal, whose daughter Isabella he later married. In 1223 he accompanied his brother-in-law, Earl Marshal in an expedition into Wales. 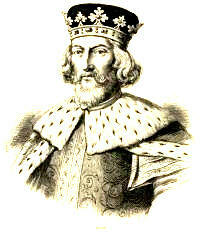 In 1225 he was present at the confirmation of the Magna Carta by Henry III. In 1228 he led an army against the Welsh, capturing Morgan Gam, who was released the next year. He then joined in an expedition to Brittany, but died on his way back to Penrose in that duchy. His body was conveyed home by way of Plymouth and Cranbourgh to Tewkesbury. His widow Isabel later married Richard Plantagenet, Earl of Cornwall & King of the Romans. John FitzRobert married Ada Baliol and in her right became lord of Barnard Castle whose founder was Barnard Baliol. The Castle is now a scanty ruin, but the remaining walls stand high on a cliff scarped, so that wall and bank are one, dropping down to the River Tees. The Castle looms over the town, and may be approached through a gate in the yard of the King's Head Inn. FitzRobert was also lord of the handsome Warkworth Castle in the border country of Northumberland. It is an excellently preserved fortress built, at the earliest, in the 12th Century. It is situated near the mouth of the Coquet River. One approaches it from a double arched bridge and finds that it is bounded on three sides by water. The walls, gateway and Great Hall are intact, as are the Lion Tower of the 13th Century and the 14th Century keep. Robert FitzRichard probably added to it in Henry II's reign. It became the property of the Percy family in the reign of Edward III, and is now held by the Dukes of Northumberland. When the Barons met at Saint Edmondsbury, John FitzRobert was still loyal to King John and was, with John Marshall, joint governor of the Castles of Norwich and Oxford. Subsequently he joined the insurrection, and took such a prominent part that his lands were seized by the King. He returned allegiance in the next reign, his Castles and vast estates were returned to him, and he was constituted High Sheriff of co. Northumberland and governor of New-Castle-upon-Tyne. He died in 1240, the same year as his father. The monk, Matthew Paris, records: "In this year died John FitzRobert, a man of noble birth, and one of the chief Barons of the Northern provinces of England." John de Lacie was born 1192, seventh Baron of Halton Castle and hereditary constable of Chester. The Lacie strongholds on the Welsh border are Beeston, Chester and Halton Castles. Beeston is now a crumbling ruin. It is hard even to identify the keep, but it could be the large wall tower East of the gate house. The Castle is perched on a height bounded on three sides by sheer drops, and a steep slope on the fourth. Its strength as a defense lay in its inaccessibility. There are two baileys, the innermost on a summit and the other situated on the sloping ground. The inner bailey was guarded on the approachable side by a gate house, two wall towers and a ditch thirty-five feet wide and thirty feet deep, which cut across the promontory. It is important to note that the artificial ravine was fashioned two hundred fifty years before blasting was known. The date of founding was in the 13th Century, and it was founded by Randolph de Blondevill, Earl of Chester. Chester was the last City to yield to William the Conqueror, and the surrender came in 1070. Once the Normans had the Castle, William's nephew, Hugh Lupus, Palatine Earl of Chester, was appointed as head of the border patrol. Chester Castle was originally built by the first Norman Earl of Chester, and now consists of modern buildings, the assize-court, jail and barracks. The one remaining Norman relic is "Julius Caesar's Tower," standing by the River. It is a square tower which has been used as a powder magazine, but is scarcely recognizable as a Norman building, because it has been recently re-cased in red stone. With the exception of this tower, another of the round style, and adjacent buildings in the upper ward, the Castle was dismantled at the end of the 18th Century. From Julius Caesar's Tower one can see the ruins of Beeston Castle, which met a like fate in 1646. Of Halton Castle nothing is left. Lincoln was the fourth City of the Realm when the Normans invaded, and it seemed to William to be a logical site for a castle. The Domesday Book states that one hundred sixty-six houses were torn down to make way for it. The Anglo-Saxon Chronicle held that on his return to York in 1068, William erected the Castle on the site of a Roman fort. Since the land was rather flat, a great bank was built up around it. There are two motes, the larger one crowned by a polygonal shell wall, which may have been built by Ralph de Gernon's widow. In 1140 King Stephen captured the Castle and, in 1216, the Surety Barons had charge of it. De Lacie was one of the earliest Barons to take up arms at the time of Magna Charta. He was also appointed to see that the new statutes were properly carried into effect and observed in the counties of York and Nottingham. He was excommunicated by the Pope. Upon the accession of King Henry III, he joined a party of noblemen and made a pilgrimage to the Holy Land, rendering valuable service at the Siege of Damietta. In 1232 Lacie was made Earl of Lincoln and, in 1240, governor of Chester and Beeston Castles. He died 22 July 1240, and was buried in the Cistercian Abbey of Stanlaw in co. Chester. The monk, Matthew Paris, records: "On the 22d day of July, in this year (1240), which was St. Magdalen's Day, John, Earl of Lincoln, after suffering from a long illness went the way of all flesh." His first wife was Alice, daughter of Gilbert 'd’Aquila, but by her he had no issue. She died in 1215 and he married second, after his marked gallantry at the Siege of Damietta, Margaret, only daughter and heiress of Robert de Quincey, a fellow Crusader, who died in the Holy Land, eldest son of Saire de Quincey, the Surety. They had three children; Lady Margaret survived him and married second Walter Marshall, Earl of Pembroke. William Malet was mentioned as a minor in the year 1194, in connection with an expedition made that year into Normandy. His principal estate was Curry-Malet. From 1210 to 1214 he was sheriff of counties Somerset and Dorset. He then joined the Barons against King John and became one of the Sureties. He had lands in four counties which were confiscated and given to his son-in-law, Hugh de Vivonia, Thomas Basset, and to his father-in-law, and Malet was excommunicated by the Pope in 1216. He was also fined 2,000 marks, but the sum was not paid until after his death, and at that time 1,000 marks were remitted, being found due to him for military service to King John in Poitou. It is interesting to note that there were five contemporary relatives named Malet, all of whom held lands in England or in Jersey. William Malet died about 1217, having married Mabel, called also Alice and Aliva, daughter of Thomas Basset of Headington. Nothing now remains of Malet's estate of Curry-Malet. Geoffrey de Saye was in arms with the other Barons against the King, and consequently his extensive lands and possessions in ten counties were seized. These were given to Peter de Crohim. Six of the counties we can name: Northampton, Cambridge, Essex, Norfolk, Suffolk and Lincoln, but we cannot be sure of what Castles in those areas were Geoffrey's, or which other four counties he could claim. While William d'Albini and his companions were holding Rochester Castle, they had been assured that other Baronial leaders would relieve them if the Castle were to be besieged by King John. Such a rescue would not have been easy unless the Royal guards were lax in watching the bridge over the Medway. If this bridge were under guard, a march to Rochester from London along the Dover Road would prove impossible, the company then being forced to detour and approach Rochester from Maidstone. Nevertheless, on 26 October, they moved in as far as Dover, where they soon heard that the King was on his way to meet them. They promptly returned to London, leaving the Rochester garrison to do the best it could. Perhaps the march on Rochester was a sop to the Barons' consciences. Had it been a serious move, it would have been an extraordinarily foolish one. The only other attempt to save Rochester was negotiatory. On 9 November King John issued letters of conduct for Richard de Clare, Robert FitzWalter, Geoffrey de Saye and the Mayor of London, to confer with the Royal emissaries: Peter de Roches, Hubert de Burgh and the Earls of Arundel and Warren. There is no certainty that these men ever met. If indeed they did, nothing came of it. We suspect that the meeting was originally planned with the hope that a proposal would be accepted, and it is not unlikely that the proposal would have been a willingness to surrender Rochester Castle to the King if the garrison could go free, but no such move resulted. Yet despite the futility of the meeting, at least we see Geoffrey de Saye connected, if lightly, with Rochester Castle. And this is the only Castle with which we are able to link his name. Geoffrey de Saye returned to the Royalist party when the civil war was over, and sided with King Henry III, thereby regaining his lost lands after the expulsion of the Dauphin. He died 24 October 1230 leaving a son, William, as his heir, by Alice, daughter of William de Cheney. King John "Lackland" I was born in Beaumont Palace, Oxford, England December 24, 1167. King of England and Ireland (1199-1216) of the house of Plantagenet, the youngest son of King Henry II of England and Eleanor of Aquitaine. He was often called John Lackland because Henry provided his elder sons with dominions but granted none to John. When Richard I, one of John's older brothers became king in 1189, he conferred upon John earldoms which comprised nearly a third of England. Nevertheless John attempted to seize the crown while Richard was being held for ransom in Austria (1192-94), where he had been imprisoned on his way back to England from Palestine after the Third Crusade. John did not succeed, and Richard on his return to England pardoned him and later reputedly designated him as his successor. After Richard's death in 1199, the legitimate heir was Arthur, son of Geoffrey, another older brother of John; but John had himself crowned king at Westminster in 1199, and fought in France against Arthur and the French under King Philip II, who supported Arthur's claim. John succeeded in capturing Arthur and, according to tradition, had him put to death at Rouen; but in subsequent warfare he lost to Philip the duchies of Normandy, Touraine, Maine, Anjou, and Poitou, which John had inherited when he became king. John was a cruel and tyrannical monarch, and his disregard of the rights or claims oaf others brought him into violent conflict in domestic affairs with the papacy, and later with the barons of England. In 1206 John refused to accept as archbishop of Canterbury the prelate favored by Pope Innocent III and in 1208 the pope punished John by issuing an interdict against England. In retaliation John confiscated the property of the clergy, whereupon the pope deposed John and commissioned Philip of France to carry out the execution of the deposition. John, who was hated by his subjects, found himself without support to fight the French king, and in 1213 to forestall a French invasion, he yielded to the pope, agreeing to hold England as a fief from the papacy. Although the pope no longer favored invasion, Philip set out for England, but his fleet was defeated by the English fleet of the Belgium coast and he did not reach England. John in turn invaded France, but was crushingly defeated in 1214 at Bouvines, near Lille. The English barons, who had long been rebellious because of John's abuses in the administration of justice, saw in John's defeat an opportunity to end his tyranny. On his return to England they drew up a petition demanding the issuance by him of a charter modeled on the charter granted by Henry I which would secure to the subjects of the kings of England their political and personal rights. John refused to issue such a charter and prepared to fight the barons. Once again he found himself without support, and when the barons raised an army and marched on London, he submitted. On June 15, 1215, at Runnymede he unwillingly signed the famous Magna Charta. He soon prevailed on the pope to issue a bull annulling the charter, raised an army of foreign mercenaries, and began a war with the barons. John died before the war was decided. He was succeeded by his son Henry, who ruled as Henry III. Runnymede or Runnimede (rŭn'ĭmēd) is a water meadow, in Egham, Surrey, S England, on the south bank of the Thames River, W of London. It was either on this meadow or on nearby Charter Island, King John signed the Magna Carta in 1215. The water-meadow at Runnymede is the most likely location at which, in 1215, King John sealed the Magna Carta, and the charter itself indicates Runnymede by name. It has been disputed whether the ceremony took place actually in the meadow, or on Magna Carta Island, a small (and now private) island in the Thames adjacent to the meadow, or at Ankerwycke, an ancient place adjoining Magna Carta Island on the far bank. Although the latter two locations are now in Berkshire, they may have been considered part of Runnymede at the time. Twenty miles southwest of London, Runnymede Meadow, with adjoining lands totaling 182 acres, was presented to the National Trust by the first Lady Fairhaven and her two sons in memory of Urban Hanlon Broughton in 1929. The memorial to Broughton consists of the kiosks, piers and lodges ('The Fairhaven Lodges') at the Windsor end designed by Edwin Lutyens. 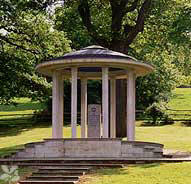 Standing at the foot of the Cooper's Hill Slopes is a memorial to the Magna Carta in the form of a domed classical temple containing a pillar of English granite on which is inscribed: 'To commemorate Magna Carta, symbol of Freedom Under Law.' This was built by the American Bar Association on land leased by the Magna Carta Trust. It was paid for by voluntary contributions of some 9,000 American lawyers. The memorial was designed by Sir Edward Maufe R.A. and unveiled on 18 July 1957 at a ceremony attended by American and English lawyers.